You can fill in random values over a selection. 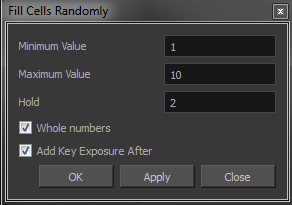 You can give a maximum and a minimum value and create a range for Harmony to choose the random values from. The selection can be over one cell or a cell range in one column or more or an entire column or many entire columns. 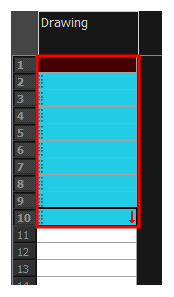 ‣ Select Animation > Cell > Fill Cells Randomly. ‣ In the Xsheet view, click the Fill Cells Randomly button (you may have to customize the toolbar to display it). In the Minimum Value field, enter the lowest acceptable value. In the Maximum Value field, enter the highest acceptable value. In the Hold field, choose an exposure holding value. 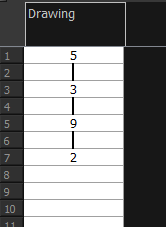 If you are applying this option to a drawing column, select the Whole Numbers option to avoid decimal points.